Yesterday the team enjoyed a stunning acclimatization hike that brought them to Laguna Cuicocha or Guinea Pig Lake. This lake is situated in the middle of lush forests and is really a sight to see! From the lake we hiked up to the viewpoint that gave us a great view of the lake and the surrounding countryside. Today the staff at the Hacienda Cusin came around and knocked on all of our doors as a wake up call at 5:00 am. Imagine walking from our rooms, through the library and into the dining room for our 5:30 breakfast; there were big roaring fires built in each of the fire places and classical music playing on the speakers. We felt really relaxed in the surroundings of this 17th century estate. Even though we were really enjoying the Hacienda, we had to get ready for our climb today. 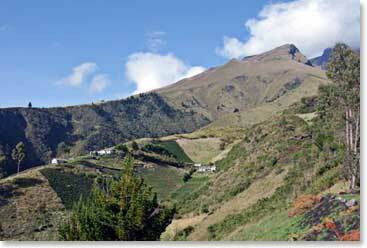 We will try to reach the summit of Imbabura which is an extremely important mountain in this region. 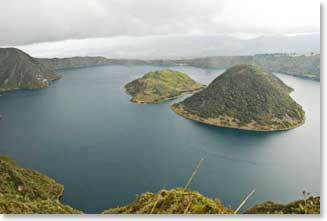 The surrounding rich farmland and the cities below all depend upon the water that comes from Imbabura. The first thing we did after breakfast was drive for more than an hour and a half to the other side of the mountain and then up through the farms until we finally reached the end of the road at about 3300m/10,900ft. Now we are beginning to walk up through the misty clouds, looking at the green farms below and seeing ridges rising into the clouds above. I can already look back to the north and see jagged peaks along the border with Columbia and Equator. We are in a beautiful, fascinating area and today’s climb should be really great! We will strengthen our legs and lungs and see some beautiful terrain as we climb to the top.